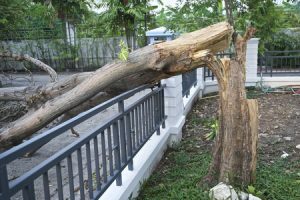 After a strong storm comes through and messes with your property, what do you do when you’ve got an injured, broken or down tree in the yard? First things first: ask yourself, “Can this tree be saved?” If you’re not sure, you might want to have Forest Tree Service come over and assess the situation. As tree care experts, the folks at a professional tree company like Forest Tree Service can help you figure out whether or not the tree can be saved or not. Indeed, it’s best not to try and “do it all yourself,” when it comes to tree care and assessment. Hiring a company that specializes in this sort of thing is good, because they’ll be able to handle high climbs and overhead chainsaw work, which means you won’t have to worry about finding and climbing a ladder and/or wielding a dangerous saw that could cut off one of your own limbs! If a storm came through, you should check to see if there are any downed power lines on your property. Check for power lines, telephone lines, cable lines and/or fence wires (which could conceivably become electrically charged). Watch your steps and don’t touch things that could shock you. If you notice hanging branches that could fall at any moment, or branches that got caught on their way down, such that they’re cradled among other branches, then those are good reasons to call Forest Tree Service. For your knowledge, it’s a good idea to remove any broken branches still attached to the tree, as well as to repair torn bark. Doing so minimizes the risk of decay agents entering tree wounds, eliminates hiding places for insects, and improves the overall look of your tree. Though you might get the urge to overprune a damaged tree, don’t do it. Also, don’t top them either, which means don’t cut main branches back to stubs. If you’re like most people, you don’t know too much about trees. Therefore, it’s best to call someone who does to take care of any storm-damaged trees on your property. In Kingwood, TX, Forest Tree Service handles all sorts of service calls pertaining to trees in the area. Please call 281-381-4125 for more information.